In November’s midterm elections, no issue played a larger role in fueling the People’s Wave that elected a record number of progressives to Congress than health care. It was the Trump administration’s push last year to repeal the Affordable Care Act (ACA) that helped animate early resistance in Congressional districts from coast to coast, including many of those that flipped the House from Red to Blue. Republicans who proved tone-deaf to citizens’ complaints at Town Halls, and phones ringing off the hook from angry constituents, paid the price at the polls. And just as women led the successful charge to defend the ACA, it is women who will drive the new Democratic majority in Congress. We’ve seen firsthand how people across the country view health care as a priority issue. A year ago, People’s Action asked 2,000 people in rural communities which issues concerned them most. Health care came out on top, with 51 percent citing it as a great concern. Two of the three issues to follow – the overdose crisis and polluted air and water – are also health-related. Across the country, Republicans underestimated support for public health care programs. Tom MacArthur, Congressman for New Jersey’s 3rd Congressional District, earned voters’ scorn the minute he sponsored an amendment – the American Health Care Act of 2017 – that sought to end coverage of preexisting conditions. MacArthur’s bill failed in the Senate, but voters in his district remembered his callous refusal to listen to his constituents. Throughout his campaign, courageous members of groups like New Jersey Citizen Action and the New Jersey Organizing Project forced him to address his position in town halls and election stops. MacArthur lost his race for reelection to first-time candidate Democrat Andy Kim, who entered the race because of his outrage over McArthur’s amendment. Kim’s father, an orphan who emigrated to the United States from South Korea, suffered from polio as a child, yet flourished in the United States once he received adequate health care, ultimately earning a PhD in genetics. Health care is the prerequisite for the American dream, he always told his Andy, not the prize. Repeal of the Affordable Care Act was also central to ousting Republican Congressman John Faso in the 19th Congressional District of New York. His vote to repeal the ACA galvanized resistance to Trump’s health care agenda, kicking off Citizen Action of New York’s “Faso Fridays,” with dozens and sometimes hundreds of constituents protesting outside his district office and public health care as a defining issue. Rival Antonio Delgado made health care a defining issue in his successful campaign, hammering Faso for his record and vote to repeal the ACA. Ironically, it was Trump’s obsession with repealing the ACA that helped cement the importance of access to health care in the minds of many voters. Even deep-red Utah, Kansas and Idaho voted to expand Medicaid in this cycle. 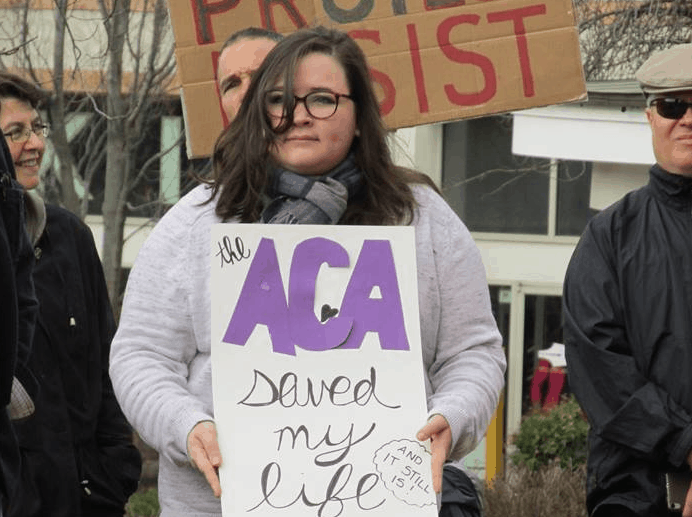 And the ACA, which in 2016 was a target of many on the right, is today a policy that everyday voters across the political spectrum want to protect and expand. While Trump’s approval ratings have stayed below 50 percent and Congress well below that, support for the Affordable Care Act reached an all-time high in February of 2018, with 54 percent supporting the act, and 42 percent disapproving. The Kaiser Family Fund poll cited the boost in support from independents as 55 percent supported the Act. Along the way, the idea of Medicare for All, a central issue of Senator Bernie Sander’s bid for the Presidency in 2016, has became a rallying cry of the Left. Several of the Democratic Senators who are expected to throw their hats in the ring in 2020, signed on to the Medicare for All Act of 2017. Now Medicare for All is no longer seen as a radical idea, as support for for it extends well into the mainstream. A March 2018 Kaiser Family Fund report showed 58 percent of voters support a plan where all Americans would have access to a program like Medicare or Medicaid. An August 2018 survey by Reuters finds that 70% of Americans support the idea of Medicare for All. With the expansion of Medicaid in “red” states including Utah, Nebraska, and Idaho, progressives have found a possible path for Medicare for All in unexpected places. Health care was not only a defining issue in Congressional races, but also at Gubernatorial level. Wisconsin’s Scott Walker paid a political price for his steadfast zeal in undermining public health care programs, seeing it as a commodity for which profit should be a defining feature. Walker has been a leading proponent of dismantling federal healthcare programs. That position turned out to be the exact wrong one in Wisconsin. Marquette Law School’s final poll heading into the elections ranked healthcare as the number one issue for Wisconsin voters. Those voters spoke loud and clear, sending Walker packing after three terms. Health care, not migrant caravans, is what American voters want. It is the priority pocketbook issue that families in America share. November’s elections demonstrated that candidates’ fighting to expand access to care through public programs will go a long way in determining how they fare on Election Day. All signs point to growing support for expanding health care access across America. We can only hope that the Democrats who won a new mandate on health care in November will now find the courage to deliver on big ideas like in-state single-payer programs, and push for Medicare for All at the federal level. Because health care is good for people, and it’s good politics.